This past weekend we spent some time with friends during which we were able to enjoy some of America's beauty and so in honor of our pre-holiday holiday I thought I'd share these titles with you as you begin (possibly) to make plans for your 4th of July celebrations. 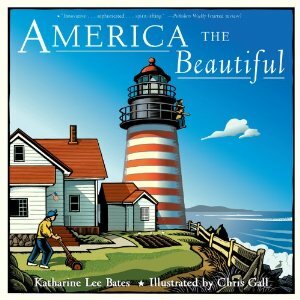 I first stumbled across America the Beautiful , (words by Katharine Lee Bates and illustrated by Chris Gall), at the library. I was disappointed to discover that this book had been out of print for a bit and was hard to find a copy of. I noticed recently though on Little, Brown kids website that the book had recently been re-released in paperback form. HURRAH! This title is awesome. First of all, the text is entirely made up of the words to this very familiar song. The illustrations by Chris Gall have a very retro-1950's feel to them which makes the book a delight to look through. Not only can you read the words, you can sing them, and while you are doing that you can gaze at the various landscapes that Gall has created. I love the way Gall evokes a spirit of pride and sentimentality, showing us pictures of World War II fighter pilots, immigrants, lighthouses and farm yard scenes. America the Beautiful is a beautiful piece of art and I highly, highly, highly recommend it for any age. AMERICA: The Making of a Nation is currently listed on Amazon at a bargain price and so I'd say to definitely take a peek and check it out! 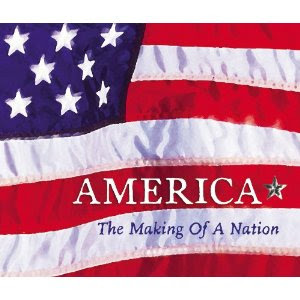 Designed for grade schoolers, this book takes a look at various historical aspects of this amazing country. Each page spread contains either lift-the-flap, maps, journals, historical documents, etc. This book is a feast for the eyes. A bit on the busier side of things, this book just feels like there is a lot to explore about America. Since that is the case I think it's rather fun and fitting! The pages are scattered with maps of the White House, pictures of political buttons, paintings of the Founding Fathers, a brief history of the American flag and so much more. As you know, I love history and I love finding creative and applicable ways of teaching it to children. In both of the books above I think there is some fun to be had in not only exploring the country but inspiring a sense of pride both in where America has been and where it is going. For the purpose of building patriots - I recommend these books! Thank you, LB-Kids, for sending these copies our way. We will enjoy these both for years to come! Sounds like they are good resources. I added the bargain to my wishlist! Since you are a history fan...any recommendations for Statue of Liberty books for age 4-7? We only have a few...and a little girl who loves it...and will see it soon. Which titles do you have? We have a Step Down reader about the Statue of Liberty that's pretty good. Both of these look like a lot of fun. I love buying books that are based on songs.